I love sardines & so does my family. We love fresh sardines as well as canned ones. Sardines contain very fine bones so it is better to use canned sardines for sandwiches & salads as canning makes the bones very soft. Sardines are very tasty… Fresh sardines can be prepared in numerous ways… they can be crisp pan fried, deep fried, grilled, steamed or curried. They just taste fabulous! You can have your pick in the canned ones as well… sardines in tomato sauce, in brine, in olive, sunflower or soya bean oil, in chilli or in mustard sauce. Fresh sardines are a favorite in Kerala & Goa. They are popular all over the world. Sardines are rich in vitamins, minerals & are a natural source of marine omega-3 fatty acids. They are a good source of vitamin D, calcium, vitamin B12 & protein. Since sardines are low in the food chain, they are very low in contaminants, such as mercury. 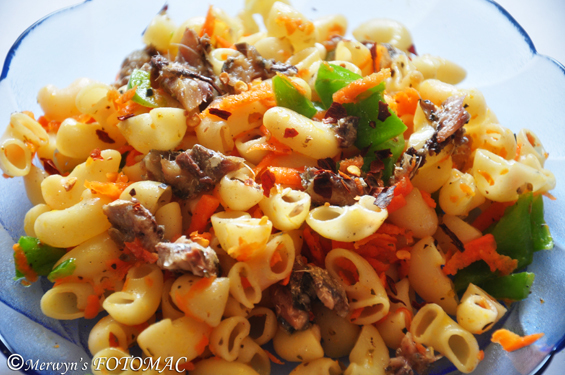 In a sufficiently large bowl, combine boiled macaroni, grated carrot & diced capsicum. Next, sprinkle dry mixed Italian herbs, red chilli flakes, & pepper. Add lemon juice & mix well. Add flaked canned sardines with enough oil to coat the salad. Drizzle extra virgin olive oil & toss it lightly. Serve immediately & enjoy your one bowl meal! thats a nice wholesome meal with sardines..